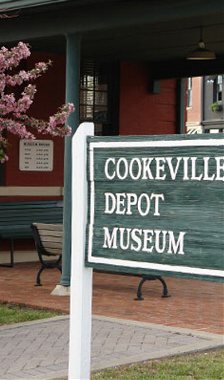 Cookeville, the county seat of Putnam County, is a growing community located in the eastern portion of Middle Tennessee. The intersection of Interstate 40 and the Appalachian North-South Highway 111 (Corridor J) lie within the city. Cookeville, the home of Tennessee Technological University, is 75 miles east of Nashville, Tennessee. Average annual temperature, 57 degrees F. Monthly average high, January 52.9 degrees F. and July 88.8 degrees F. Monthly average low, January 37.9 degrees F. and July 67.2 degrees F. Average annual precipitation, 51″. Average annual snowfall, 8″. Prevailing winds, SE. Mean length of freeze-free period, 211 days. Average relative humidity: 12:00 Midnight – 79%; 6:00a.m. – 85%; 12:00 noon – 48%; 6:00p.m. -62%. Altitude: 1,140 feet above sea level. Numerous retail outlets including Sears, Kohls, Wal*Mart, Various outlets, TJ Max, and many others.